Unfortunately, my pair of flat shoes decided to come apart at the seams on Wednesday, which meant it was time to shop for a new pair of shoes. 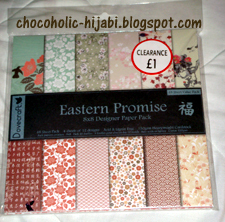 Yesterday, I found these at Priceless shoes for £5! They look silver on the website, but they are infact more of a gold-ish colour. I love them because they are flat (I'd rather be short than embarass myself by walking in heels) and practical to wear to uni. A random look around the clearance section at WH Smith's found me buying stuff that I probably wouldn't pay full price for. 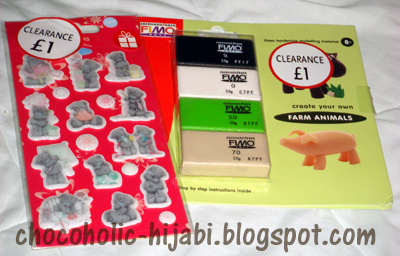 This includes the FIMO farm animals kit, 8x8 Eastern Promise Patterned Paper and Me to You stickers, each of them priced at £1. "I love them because they are flat (I'd rather be short than embarass myself by walking in heels) and practical to wear to uni. " hahahah :D I know how you feel, sis. Feel the exact same way!